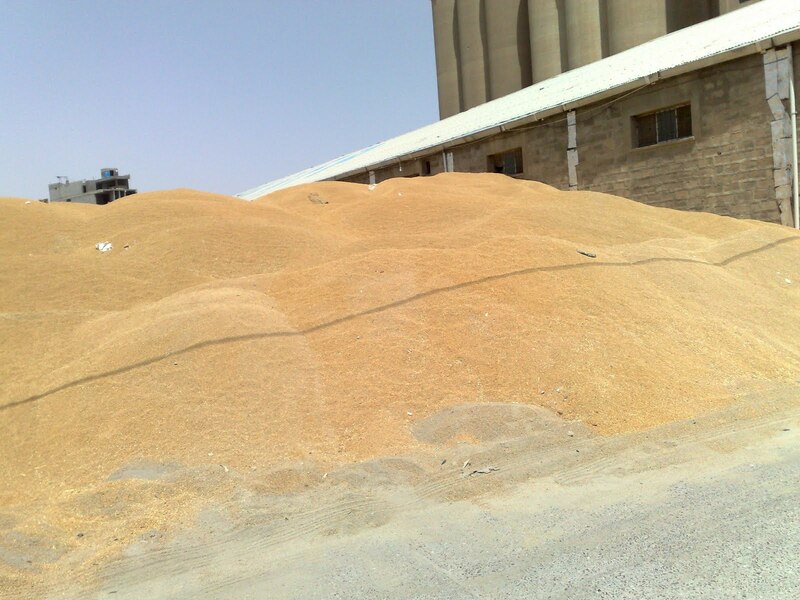 The storage of wheat in the open gives rise not only to economic loss but also to health risks. Wheat is considered suitable for shipment and storage when its water content is less than 15% and when the moisture content of the grain rises above this level mold growth, mustiness, agglomeration (clumping together of grains), self heating, fermentation and premature germination can occur resulting in considerable damage and economic loss. Wheat seeds are biotic stores of nutrients that are affected by warm temperatures and moisture. The grain seeds can begin to germinate and the respiration process that takes place will produce more water (sweating of the grain) and affect neighbouring seeds so the damage spreads. In addition the temperature within the stored grain will increase (self-heating). If grain begins to germinate it cannot be used for flour production and is only fit for alcohol production. In a warm, damp environment fungal molds can grow causing deterioration of the grain which becomes musty. Musty grain has a smell and undergoes flavour changes that will remain even after the grain has been milled and cooked. Freshly harvested wheat is at greatest risk because of its higher water content. It should be dried before shipment or storage but when wheat is stored open to any rain the moisture content will rise. If grain is stored in the open it is at greater risk of losses caused by insects, (e.g. weevils, flour beetles, cereal moths) that will have easy access to the grain. In addition rats and mice will find easy access to this food supply and in feeding on the grain they will contaminate it with faecal droppings and urine. Rodent contamination can lead to the spread of enteritic diseases to man, e.g. Salmonella, cholera and rats are responsible for the spread of the bacterial disease Leptospirosis which can lead to death in humans. In addition birds, eg. Sparrow, pigeons will be attracted to the free food represented by the grain and in turn can assist the spread of bacteria such as Salmonella and Esherichia into the food chain.